The latest character for MOBA-style action game Battlerite has been announced ahead of a release tomorrow, November 10. 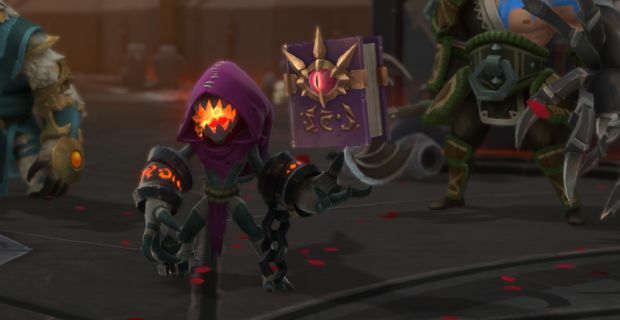 Ezmo "The Mischievous" is the newest character, launching as part of patch 0.9. He's described as an "aggressive spell caster." It's a role he's able to fill thanks to his quick movement, which is made possible through his ability to teleport. You can get a quick look at him in action in the trailer above. Update 0.9 also introduces some new features. At the end of a match, you can opt to stick with your current team, allowing the group to move on to another game together. Additionally, characters can now be leveled up to 20. More rewards will be available for doing so, including titles and Legendary chests with guaranteed Legendary items. Character changes are also coming. Many of these are of the bug-fix variety, while others are proper balance adjustments. Croak will now move more quickly than before while Camouflage is active, Frog Leap does more damage, and his Battlerites have been adjusted in positive and negative ways. Lucie's Toxic Dart has had its damage-over-time reduced, and Poloma's Other Side now heals her and nearby allies when its effect wears off. You can see all of these changes in the full patch notes. Battlerite developer Stunlock Studios says it's continuing to work on additional characters. The goal for the next "major" patch will be to address the ranking system, add winter-themed content, and continue making balance changes to Battlerite trees. Battlerite officially launched on Steam in September, making a strong debut.